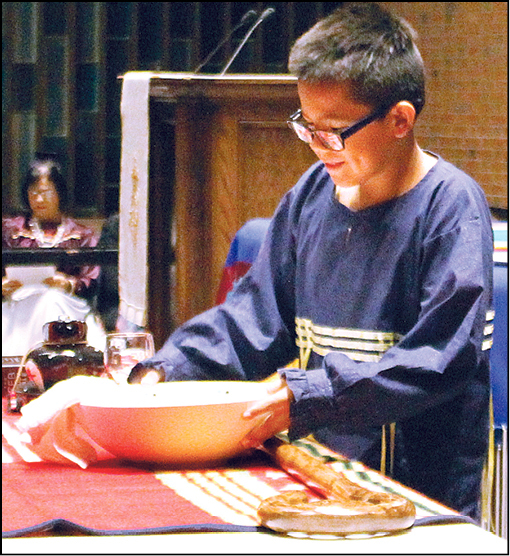 More than 200 people worshipped and feasted as the Oklahoma Indian Missionary Conference (OIMC) celebrated the assignment of Bishop Jimmy and Mary Nunn, on Nov. 6 at Oklahoma City University. They were welcomed by OCU President Robert Henry. The school’s clock tower chimed as the bishop vowed to "serve faithfully and well" right after receiving symbols of his role. Pastor Mike Svitak read "The Character of a Bishop," from Titus 1:7-9, and OIMC Lay Leader Ramona Eyachabbe conducted the covenant liturgy. Throughout, tribal hymns were sung a capella. Bishop Nunn said, "I heard a lot of joy today in songs I don’t know; my heart is uplifted." Youths collected the offering, designated for Water Is Life. Eight churches prepared the community meal. Worship was in the OCU chapel building named for another bishop, W. Angie Smith, who led Oklahoma Methodists for 24 years.